The time that prospective teachers must spend in elementary or secondary school classrooms will be at least 70 days. The change will take effect for those entering college schools of education in fall 2022. ALBANY — College students intent on teaching careers will be required to spend more time training in elementary and secondary classrooms under new regulations that won state approval Tuesday. 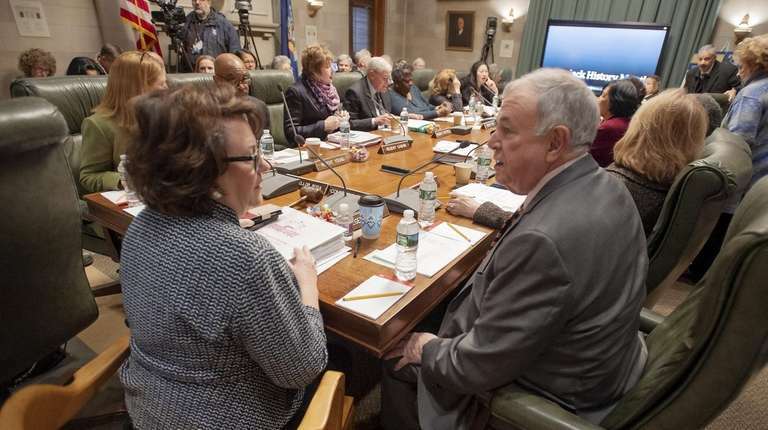 The state Board of Regents, which sets education policy, unanimously approved new rules that will extend minimum student-teaching time from 40 days to 70 days — the equivalent of an entire semester. The change will take effect for students entering college education programs in fall 2022, according to John D’Agati, a deputy state education commissioner who coordinated the push for stronger requirements. About 42,000 students statewide are enrolled in collegiate teacher education programs, federal education data shows. For most, student teaching comes in the final year of their program. A full semester of student teaching, during which trainees spend time in public school classrooms working directly with children under the guidance of experienced teachers, already is common practice on Long Island and across the metropolitan area. However, Regents board members who began examining the condition of teacher-training programs a decade ago fielded complaints at the time from many college students that they were not getting enough practical work experience or adequate professional guidance when assigned to classrooms. “Student teaching is the most important part of education school and less than a semester of that doesn’t give them enough time to explore what teaching is all about,” said Roger Tilles of Great Neck, who represents Nassau and Suffolk counties on the Regents panel. Nationally, there is a movement toward extended periods of student teaching for those studying to enter the profession. New Jersey in September adopted the requirement statewide of a full semester of student teaching. New York’s new rules seek to boost the quality of the student-teacher experience as well as the length of time required for the thousands of undergraduates who enter college education programs each year. For example, the regulations approved Tuesday require schools of education at colleges and universities to sign memorandums of understanding with the school districts to which trainees are assigned, spelling out details of their professional development. “It’s going to take some time to ramp up,” said Albert Inserra, dean of the College of Education and Information Technology at LIU Post in Brookville. One approach to teacher training getting increased attention across the country is a residency-type program that blends academic studies toward bachelor's and master's degrees with a full year of paid teaching experience. Under this system, teachers in training, like medical interns, take on increased responsibility on the job as their development progresses. Jay Lewis, an associate dean at Hofstra University’s School of Education, said the institution is working toward pilot programs with such innovations. Lewis is in charge of external relations and field placement — that is, coordination with school districts that accept student teachers. “My gut tells me that within the next 10 years, what teacher training looks like in terms of field experience is going to be turned on its ear,” Lewis said.